Bodywork, one thing that most people hate. But...it can be very rewarding although it is a lot of work. When working on a glass body the first thing you have to do is sand the gel coat so it will accept primer and filler, just as you would if it was steel. What you see here is the body after initial sanding. Make no mistake this causes a LOT of dust. This glass body really required little filler. There were some places on the sides and doors that needed a little straightening and some small spots where the door gaps needed a little work but overall it was pretty good. There was one spot that did require a bit of work. This body sat for over 10 years before being mounted to a frame and although it fit quite well the trunk had cured with a little more "curve" on one side than the other. This made the trunk lid about a quarter inch higher than the quarter panel on the passenger's side. There are at least three ways to fix this. 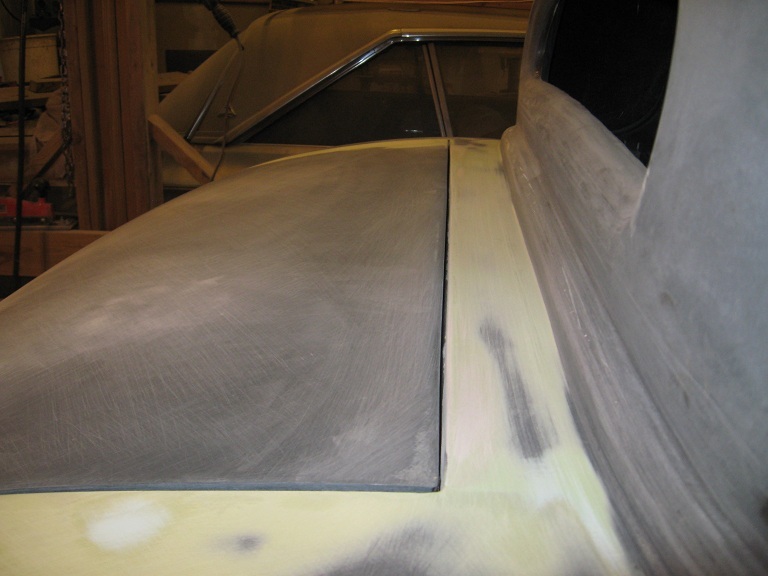 Just bondo the quarter up till its level, cut and rework the trunk lid to take out the excess curve or what I did, raise the quarter with a combination of fiberglass and filler. 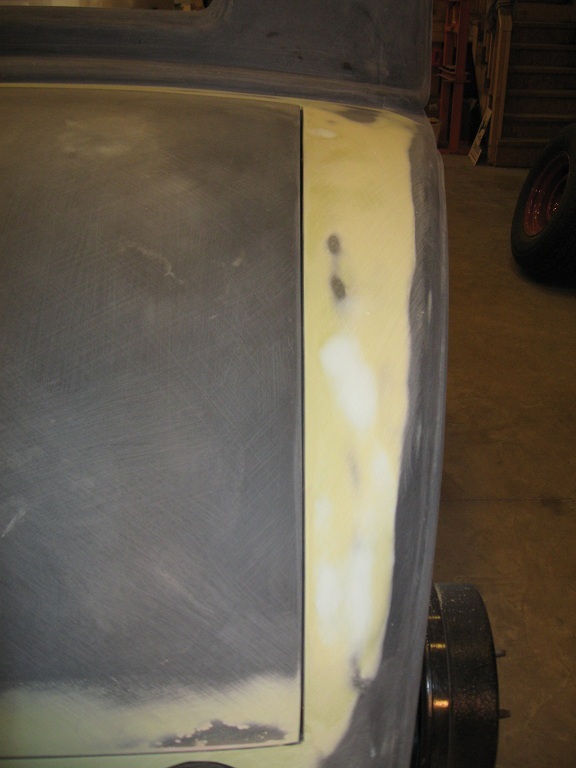 The first thing anyone should know about filler is that you should never, repeat NEVER use filler for anything when it will wind up being more than a quarter inch thick. Doing so is amateurish and guaranteed path to failure. So... the solution is to use a few layers of chopped mat and resin to build up the area first, then use filler to "fine tune" the surface. In this case three layers of chopped mat were used and then just a thin layer of filler was needed. The result is a quarter panel that meets the curvature of the trunk perfectly. Another place that needed a little work was the top gap of the trunk. This had a little curve to it which made the gap wider in the center that it needed to be. So.. a little work was done to straighten this out and make it even. 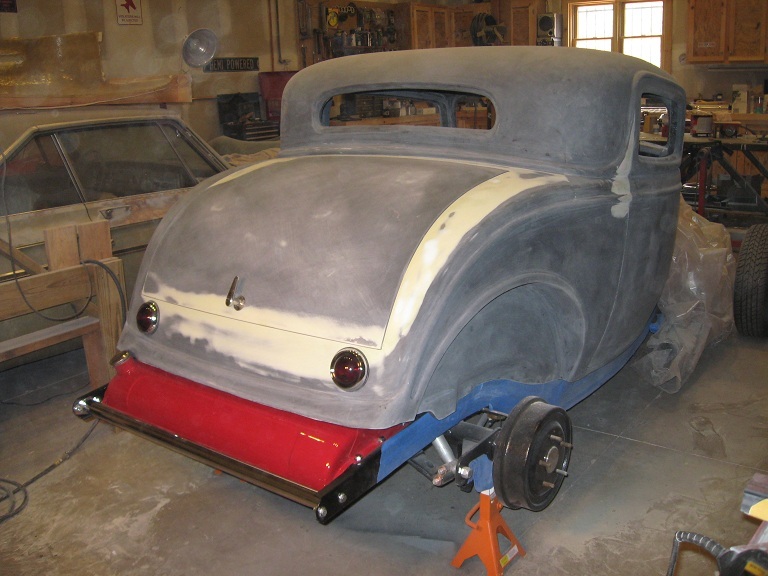 With the basic bodywork and sanding done it was time to locate the '50 Merc taillights and drill the holes. This is a totally subjective procedure and I can only explain it as being "what looks right" to you. Here are the lights installed. At this point the body is really ready for its first coat of primer. However, I wanted to fabricate a couple little odds and ends first. One was a license plate mounting bracket. I looked through a lot of pictures (hundreds really) to finally settle on the "look" I wanted for a license plate light. What I finally went with was one from The Hot Rod Company. It is "old school" and works very well with the overall look of the car as well as the theme of the build. This unit does not come with a "mounting bracket" so one needed to be fabricated. What you see here is what I came up with. I think it works pretty well. The chrome part is what comes from The Hot Rod Company and the black section is what I made out of 1/8" steel. It perfectly matches the surface of the body and locates the license plate close to the surface for a professional look. Here's a shot with a plate installed. This unit mounts with two bolts. Here is a shot of the hole locations. Above the two holes is a grommet for the wiring for the light. Next on the list is outside rear view mirrors. Most "hot rods" use what are called "peep" mirrors. These mirrors generally clip to the edge of the door and are held there with a couple set screws. This is fine if you happen to have a steel deuce or Model A but with a body that has fiberglass doors it may not be a good idea to be clipping mirrors to the the thin edge of fiberglass at the edge of the door. The solution is pretty simple. Instead of clipping on the door we want them to bolt on. These mirrors come in basically four pieces. The mirror itself, the mounting arm, the mounting base, and the mounting bracket. The first step is to trash the clip on bracket (seen in the upper right corner of this picture) and replace it with a similar sized piece of 1/8" steel that has a couple locating pins. This is the piece that has the screw through it in the picture. The locating pins are nothing more than a couple screws that have been welded to the plate and cut to a short length. Next once the location has been determined all you need to do is drill a hole for the mounting screw and the locating pins. 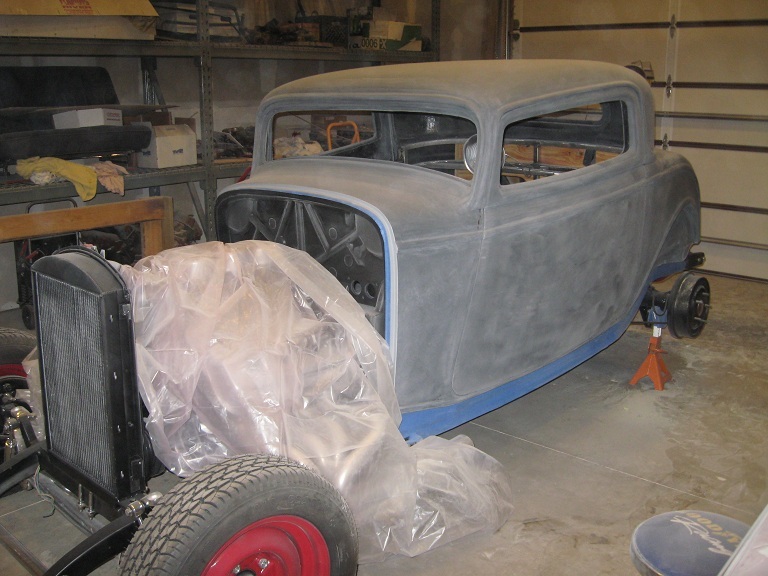 The last order of business for this update is to get the body in a coat of primer. Its not necessary to protect it but a good coat of primer will show you if there are any places that still need a little tweaking before you move on. In my case any further bodywork will wait till spring as it is now getting too cold to use filler and primer in an unheated shop. However, I will not quit working on this till spring. From now till its warm enough I'll busy myself with making interior panels, upholstery, wiring, and finishing the mechanicals. Trust me, there is plenty of work that still needs to be done. Everything was taped off masked and the door and trunk jams were sprayed first. I let them dry over night and finished spraying the body the next day. Temps outside were in the 50's but in the shop with the help of a propane heater I managed to get the temps up to over 60. The heater was shut off while spraying and since I sprayed in the morning the temps outside rose enough that the entire shop stayed above 60 all day. You'll notice the grill shell is a Zinc Chromate green. That's because I had just enough primer left over from doing the frame and I saw no reason to waste it. When it comes to the final color, it won't make any difference. I'm using Martin Senour paints for this project for a couple reasons. They're decent quality and they're available locally. Call me old fashioned but I'm not one to mix and match paint systems. Today's automotive paints are a miracle of modern chemistry and each company formulates their products a little differently. You can never be totally sure one manufacturer's paint will work with someone else's primer or clear coat and rather than take the chance of ending up with a big mess, I always use products I know are formulated to work together. Plus, living in a small town has its disadvantages as the nearest paint jobber (besides my local NAPA store) is 2 1/2 hours away. Since NAPA carries Martin Senour paints and I'm not doing some kind of wild custom paint job, logically that is the way to go. So that's it for this update. The body is in primer, I found that I do have a few small places that need some final touches before block sanding and ... I'm finally ready for winter. Next time I'll be starting the wiring and interior panels.